Dear NFL, we're not all like this. Tom Brady appeared untouchable following reports about his ability to let the air out of his own balls before Super Bowl 49. Robert Kraft, owner of the New England Patriots, was particularly glib and almost supportive of the NFL during its investigation of “Deflate-Gate” because his buddy Roger Goodell was having such a hard day/month/life. That’s different. The guy cheated, but he still seems to think that nothing can touch him–not even airborne diseases or his own employer. Welcome back to the real world, Tom Brady! And what say you, Mr. Kraft? In a striking reversal of tone, owner Robert Kraft on Wednesday ripped what he called the NFL’s “unfathomable” decision to uphold a four-game suspension of star quarterback Tom Brady, ending a two-month cease-fire that began with Kraft’s acceptance of separate sanctions on the club. 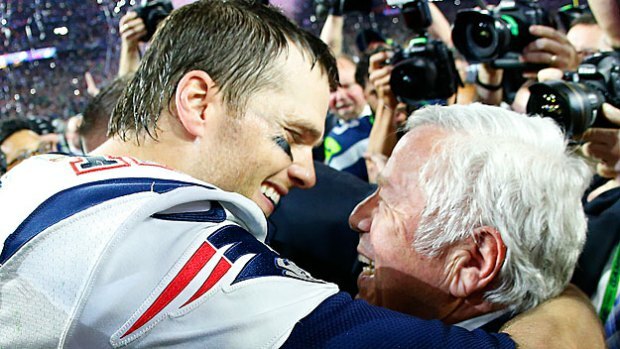 Mind you, the NFL noted that Brady’s suspension was for “conduct detrimental to the integrity of the NFL” and for “failure to cooperate in the subsequent investigation.” Kraft supported Roger Goodell because he knew his friend would give him the typical slap on the hand that justice would prevail. We would like to remind everyone that the “flip off your boss” approach is generally limited to untrained, spoiled brats. Please don’t try this media relations strategy at home.